Here are a few nice words our guest had to say about their experience at the Alberg/Lluria Hostel by Sant Jordi Hostels Barcelona. I first stayed at this hostel 5 years ago and it’s only gotten better since. Super central/convenient location, clean and well-cared for facilities (5 years later and everything has been maintained flawlessly! 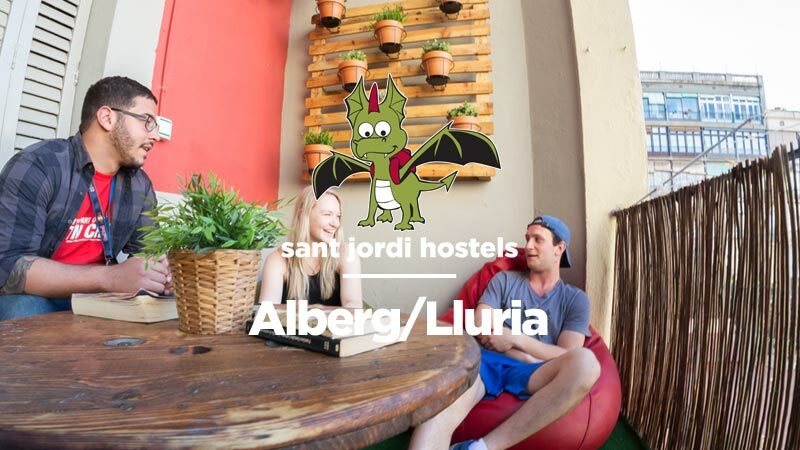 ), really fun and social atmosphere, family-style dinners, and incredibly fun and helpful staff – Sant Jordi Alberg is probably the closest thing you can find to a perfect hostel. Special shoutout to Norbie, Agustin, Fran, and Pedro – you guys are amazing!!! I had the best time at Sant Jordi and ended up staying for a LOT longer than I had planned! The staff Pedro, Daniel, Renato and Emy really made my stay! I’ll be back! Sant Jordi was a great experience. Gonzalo, Mauro and Cacau were so much fun, and they really helped a lot. The rooms are the best I’ve seen during my trip, and the parties were epic. Did not want to leave, and will definitely go back. Thanks guys! I stayed in the Sant Jordi Hostel weekend of 19-21st March. Met a guy called Rich who was a stuntman from Baltimore. Would like to get in touch with him but didn’t get his contact details. Please post back if you know him. Hostel is the best I’ve ever stayed at. Great staff, clean, comfortable and very sociable. I highly recommend a stay here. Hi Sabrina, Your best bet is to try to contact the hostel directly at lluria@santjordi.org. Glad you had such a good time while staying with us. I’ll be visiting here for a week starting June 15. From the comments i’ve read i’m extremely excited and know that this trip, although i’ll be traveling alone, will be extremely exciting and i’ll meet loads of people. I’ll gladly update hostel satisfactions when I return. I stayed in Sant Jordi Hostel for 4 days in october and it was really AMAZING!!! The pub crawls were the best, the hostel is very clean and the staff is fantastic. Special greets to GONCALO and MI(C)KI (sorry, but don’t know how to write your “name”). I will never forget you and the parties..!! Hopefully i can come back soon!! I cannot rate on hostelbookers/world because my friend has booked the hostel for us. Thanks for the great time! I really enjoyed it a lot!!! Hey! I would like to say thank you to all those who made our time in Barcelona so special. We met lots of cool people in the hostel and we enjoyed our 6 days there!!! Awesome Staff! Giovanne, Abel, Gabriel, Edgar, rock.Thank you.